This is a sample entry from Don DeBartolo’s email newsletter, Trade Spotlight: Futures, published on Tuesday, September 5, 2017. 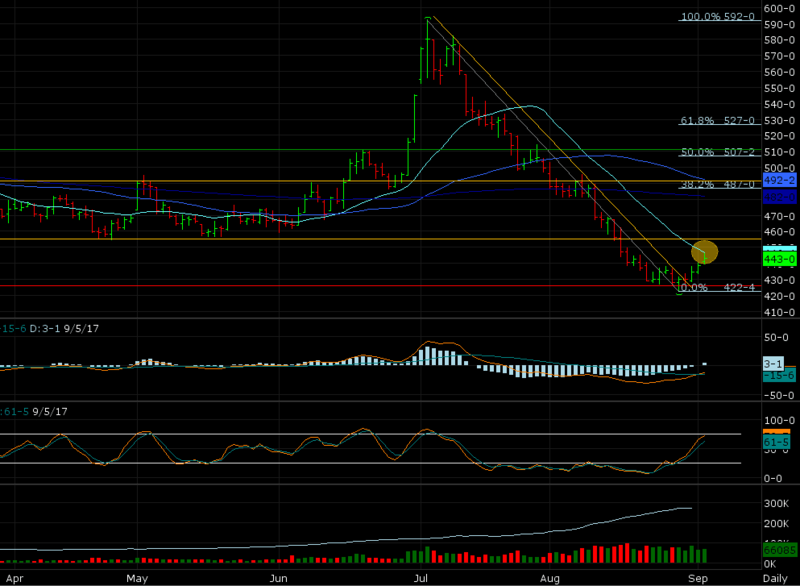 There is a trade opportunity based on a potential breakout in the Chicago Wheat futures market. The market appears to have bottomed out setting up a twelve-month contract low at 422’4 (8/29/17) moving into the harvest and fall season. The MACD and Stochastic indicators have both shifted bullish even if Trend Seeker is still down, albeit with a weak ranking. Anticipating a change in Trend Seeker on the breakout. Buy the December 2017 Chicago Wheat on 447’0 using a stop order, GTC. You can trade the mini Wheat futures contract with an Initial Margin of $264 and Maintenance Margin of $240. The risk is $210 and the profit is $630 based on the same price points above.